Overnight there was thunder and lightning. The cold front pushed temperatures down and the forecast was for more of the same. 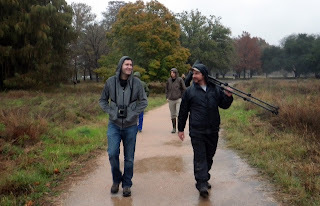 So when Stephen Ramirez wanted to find a good location for the December 3rd bird walk the selection was geared to relatively dry pathways, shelter opportunities and, of course, good birding. We got all three at Spring Lake and the Meadows Center. 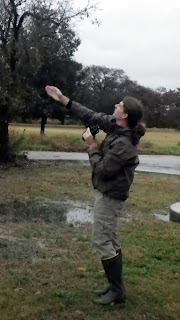 From the beginning we had fly-overs of Great Blue Heron, Cormorants and, of course, Vultures. Even the Osprey circled over the lake looking for a breakfast meal and flew overhead at least twice. A pair of ducks also flew the length of the lake while we viewed the morning activity from the newly repaired boardwalk. Viewing the Yellow-bellied Sapsucker from the parking lot. While we scoped and glassed the different birds we we able to watch the Ospry devour a large bass (?) on a light standard and a Kingfisher devour something a little smaller. A little unusual were the pair of Killdeer on the the lily pads next to the boardwalk. The wooded area next to the boardwalk yielded the usual little guys like titmouse, goldfinches, wrens and chickadees. The grassland meadow that replaced the buildings that once was the Aquarena attraction was now home to sparrows, warblers, cardinals and others. Colton Robbins and Romey Swanson endure the cold rain. Birding hikes are led by Stephen Ramirez and assisted by Colton Robbins who compiles the list of birds we see. Contact [email protected] to be added to the eMail list for January’s birding hike in the San Marcos natural areas. Next week the San Marcos Greenbelt Alliance is sponsoring a “bug walk” at the same Meadows Center/Spring Lake location. The hike will be led by Gabby Cole Dec. 10 at 2 p.m. More information is contained in an earlier LOOP post to this blog. 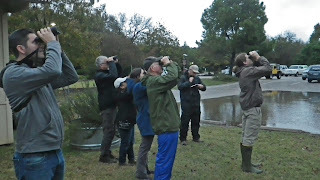 Comments: San Marcos Monthly Bird Walk. 49 degrees, little to no wind, raining on and off. Stephen Ramirez locates the birds.